Once upon a time, Facebook was the brightest, shiniest social media star. Businesses flocked to its platform lured by promises of followers aplenty. Over the years however, we have gotten distracted by other newer platforms (Instagram anyone? 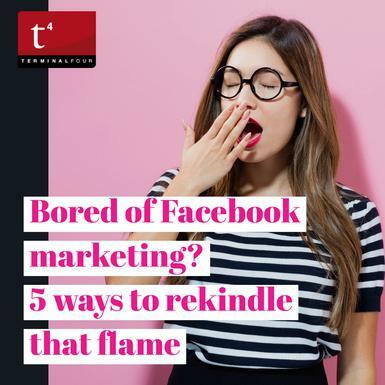 ), we have seen our Facebook news feeds littered with the ghosts of companies, bloggers and strangers of yesteryear and we have gotten frustrated by increasingly complex algorithms designed to make us dig deeper into our pockets. 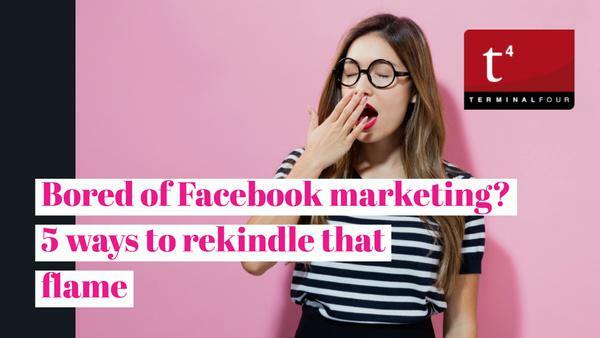 But, despite all the rocky patches in our relationship with Facebook, you have to admit, it's a steadfast and solid platform that has always been there for us. Today we thought that we would write a blog based on a recent brainstorming session we had about Facebook. We realised that we haven't been entirely fair to it of late and perhaps, there's life in the old dog yet. When we got talking about how we all use Facebook, the word reviews kept popping up. It's true, looking for a restaurant or a new coffee place, you will likely check out a review on Facebook. We all know that students use social media to research prospective universities so spend a little time working on building up your student reviews. Remember, it's important to respond to reviews (especially the negative ones). If you don't have the Reviews section of your website turned on, you can do so by navigating to settings, edit page, tabs, reviews, settings, switch on show reviews and then hit save. If you want some inspiration, take a look at University of Southern Queensland, they have almost 600 student reviews and an average rating of 4.4 stars out of 5. In the world of social media platforms, someone is always copying someone else. Instagram copied Snapchat and now Facebook have copied Instagram! Facebook Stories (available in their app) allows students to add filters, geolocation tags, and text to your university's stories. Stories allow you to post more frequent updates, feature student takeovers and, showcase live events. In the past, email and phone calls have typically been the most common ways of contacting universities. However, adopting a social media messaging strategy. While time consuming, can significantly impact on engagement with students. We know of one university who dedicated themselves to promptly answering every single query that came through Facebook and a year later are now attributing an increase in applications to this very endeavour! We're always surprised by just how successful Live events can be, both in terms of reach and engagement. Even if you hold a live event and only a handful of people tune in at that time, if the content is relevant and useful, your audience will watch and share it after the event. From live streams of commencement speeches and football games to recruitment Q&As and open day highlights, there's a myriad of ways to use Facebook Live to your advantage. Take a look at this Facebook Live from the University of Birmingham, which features a handy tour of their student accommodation as well as some useful advice on how to apply. It's easy to overlook Facebook as a place to share images and videos. We tend to think of Instagram when we want to share images and Facebook when we want to share news and announcements. Using hashtags on Facebook however, can be a great way to collect student generated content. There are lots of apps like Instagram Page App (https://apps.facebook.com/instagrampageapp/?ref=br_rs) that allow you to easily add your Instagram gallery to your Facebook page. Cross-selling at its finest! For the first quarter of 2018, Facebook had 2.19 billion monthly active users, while changing algorithms and the lure of new social platforms, present challenges, Facebook still has a lot to offer universities. Let us know, Is Facebook still your number 1 platform or have you moved on? It certainly was in our 2017 Higher Education Digital Marketing Survey.